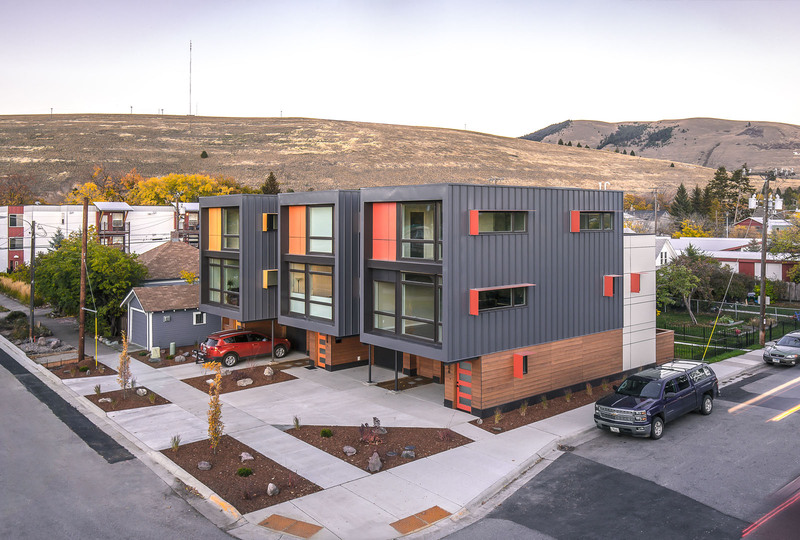 These modern townhomes are located on a unique infill site in Missoula’s mixed-use Northside Neighborhood. 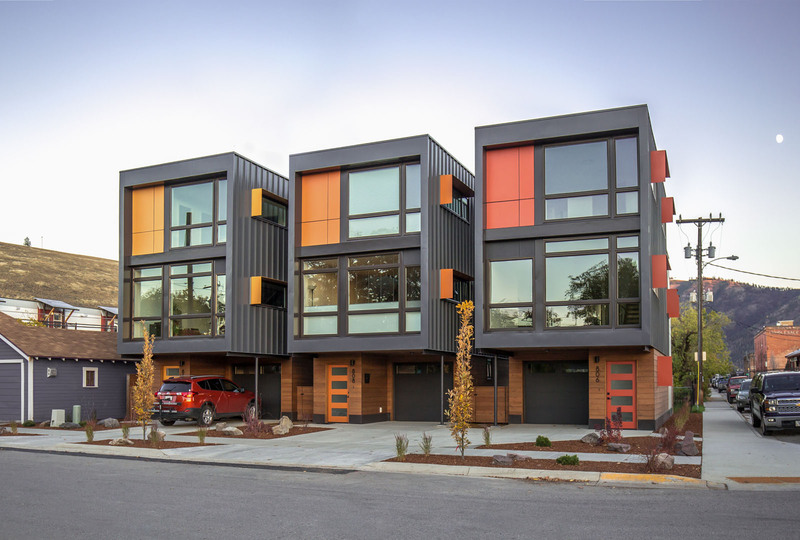 The project takes scale cues from the community brewery and other railroad era structures down the street. 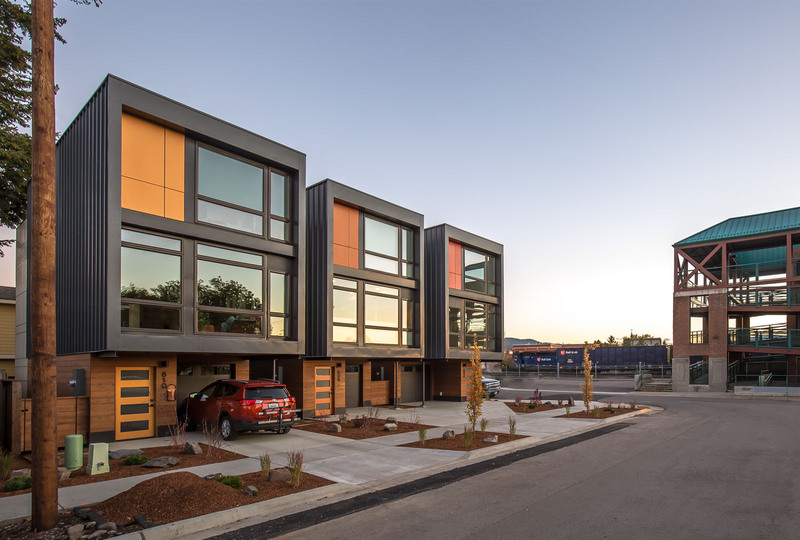 By increasing the site density in a sensitive and appealing way, the project promotes urban sustainability principles of walkability, public transportation access, and reduced infrastructure and sprawl. 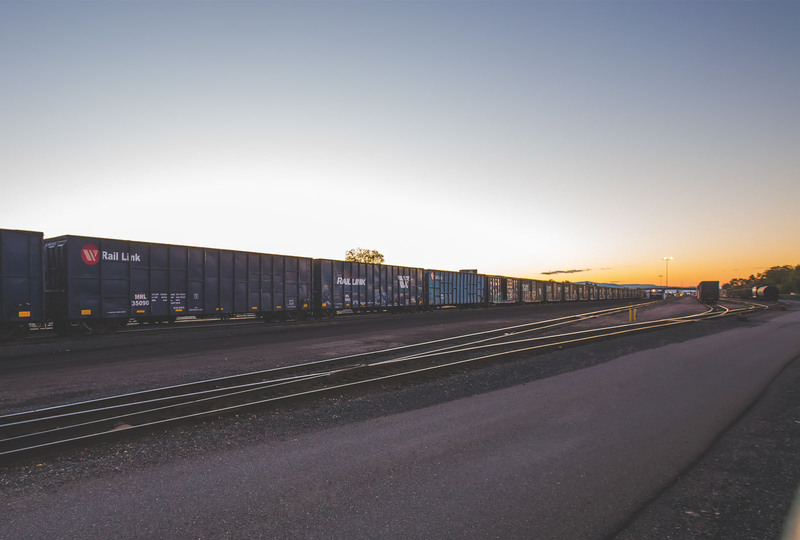 The site is in close proximity to many local business and bus stops. Additionally, a pedestrian bridge to downtown is across the street. Prior to construction, the site was cleaned up and remediated to remove hazardous materials and debris from a previous structure fire. 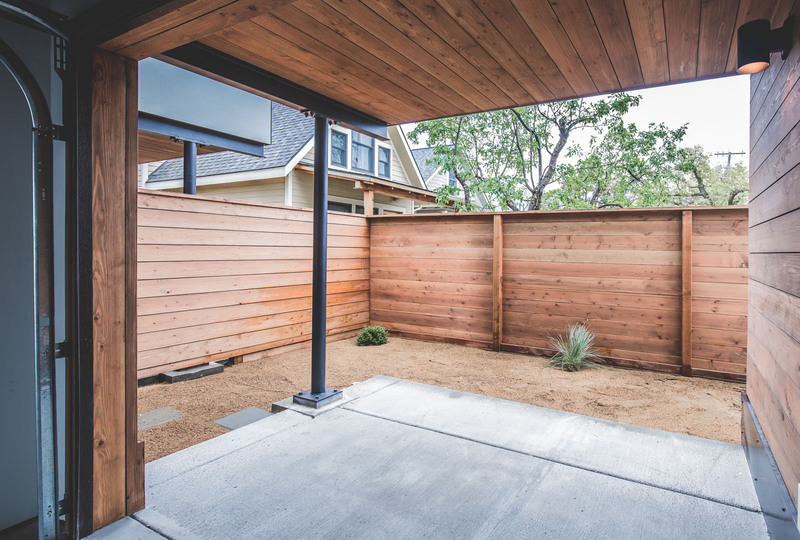 Now, native, low-water plantings and decomposed granite reduce water use as well as site runoff. Best of all, the occupants have a low maintenance, beautiful landscaping to enjoy. 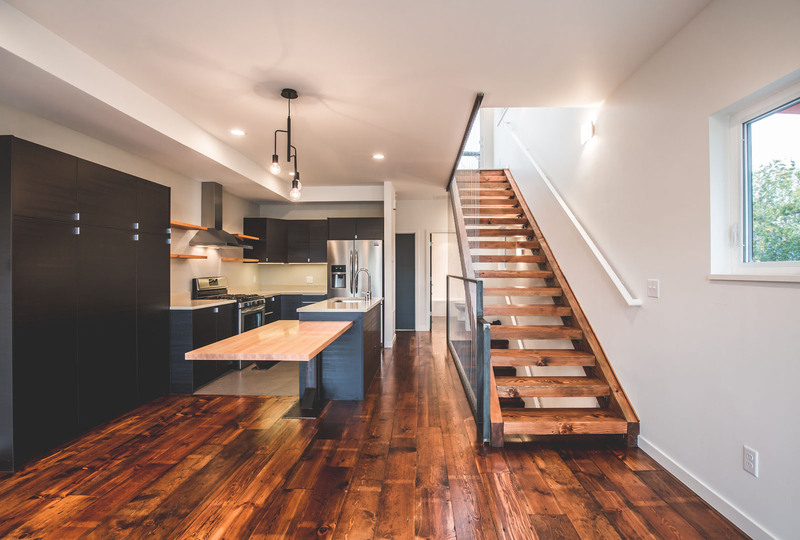 Every space was carefully considered in order to give the occupants a home that feels much bigger than its small square footage suggests. 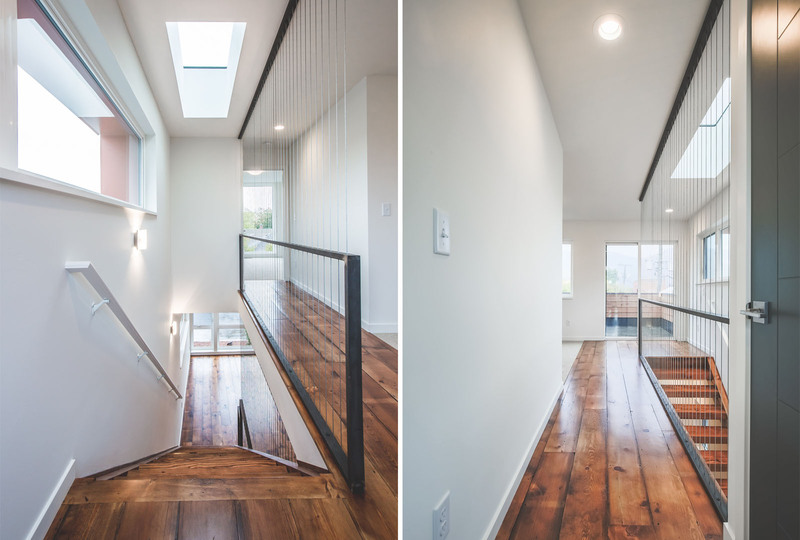 The living spaces are set a floor above garage, utility, and entry space. 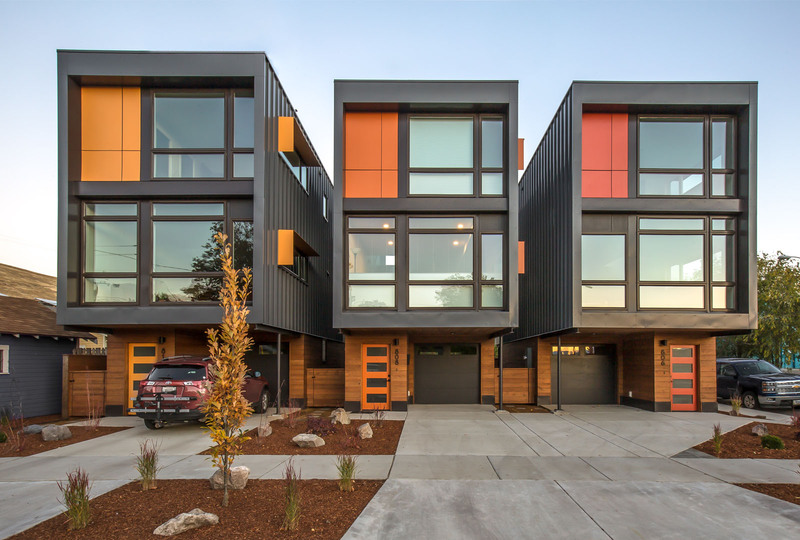 This configuration allows for large windows as well as privacy from the street through a change in elevation. The floor-to-ceiling windows provide a connection to the outdoors and plenty of natural daylight. Shading devices were placed on southern windows to reduce overheating in summer while providing solar gain during the winter months. 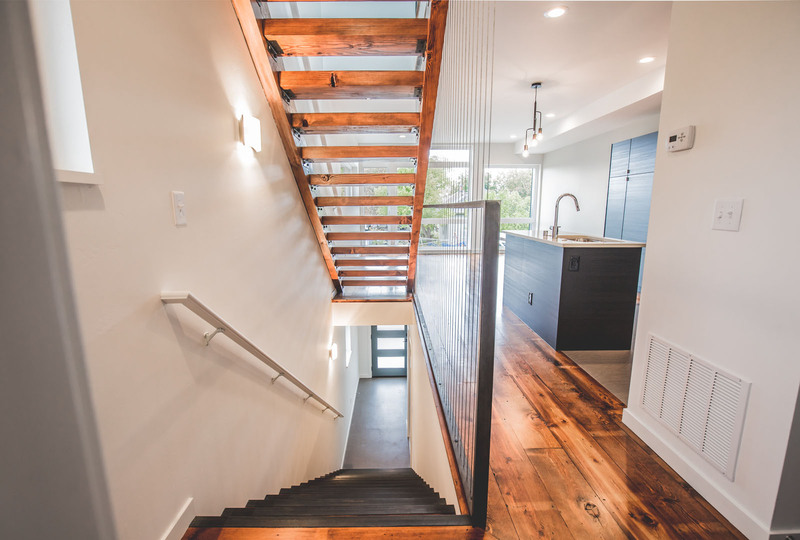 Locally reclaimed fir floors provide a warm, homey character and contrast with the modern clean lines of the design. The wood siding was milled nearby in Florence, MT. 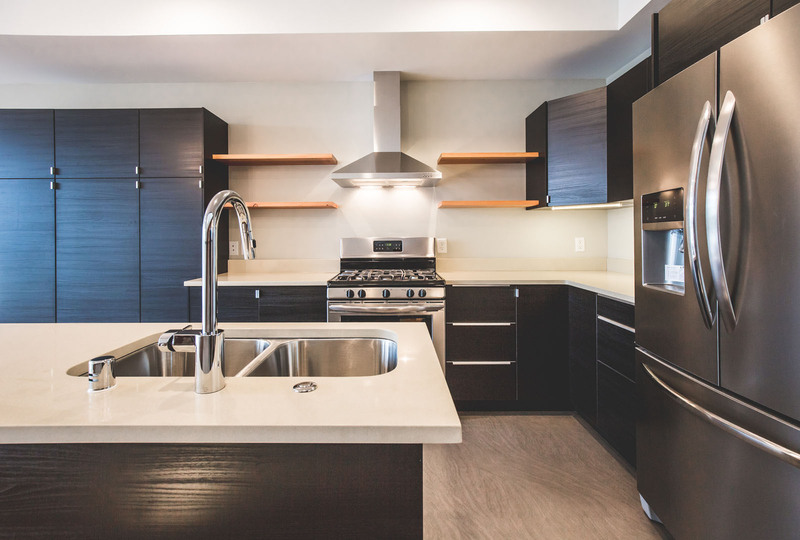 Roof decks increase the outdoor space and provide outstanding views of the nearby mountains and downtown. The top two floors are larger than the bottom level, providing covered outdoor space at ground level on both the front and rear of the buildings. 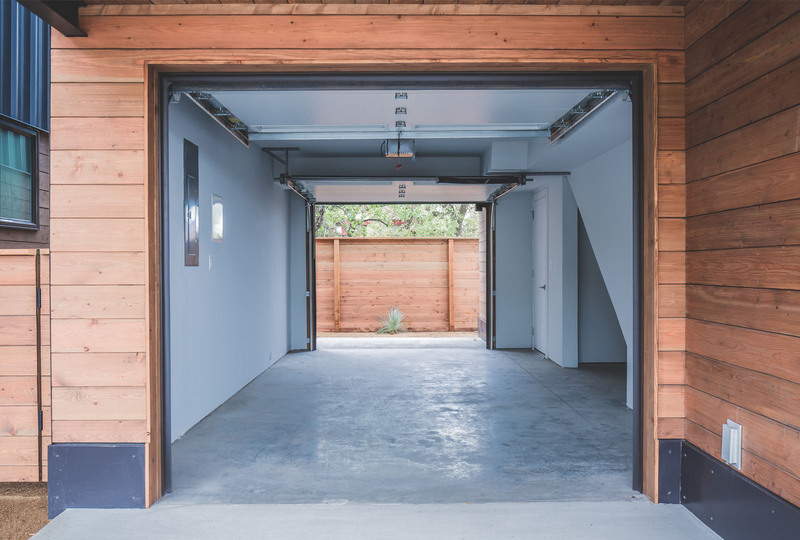 Double door garages serve dual functions as vehicle storage and additional outdoor living space. 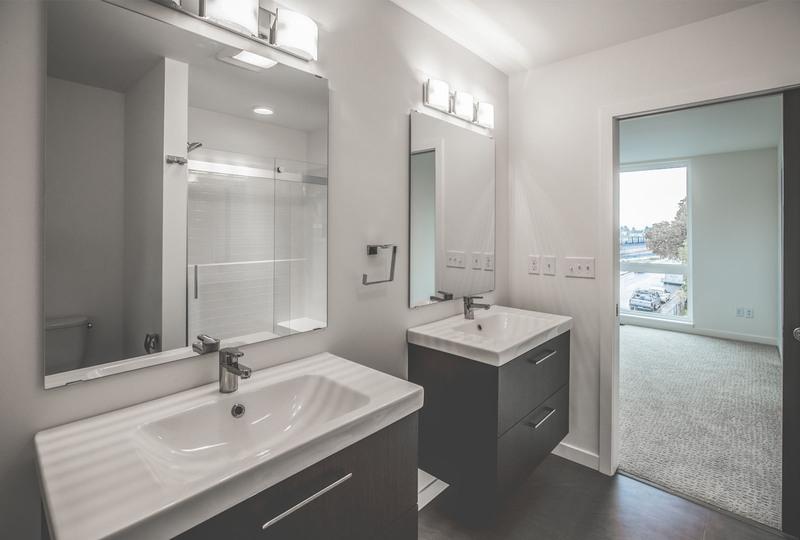 The true measure of success for this project is that each townhome sold before construction was completed at a comparatively high price per square foot. 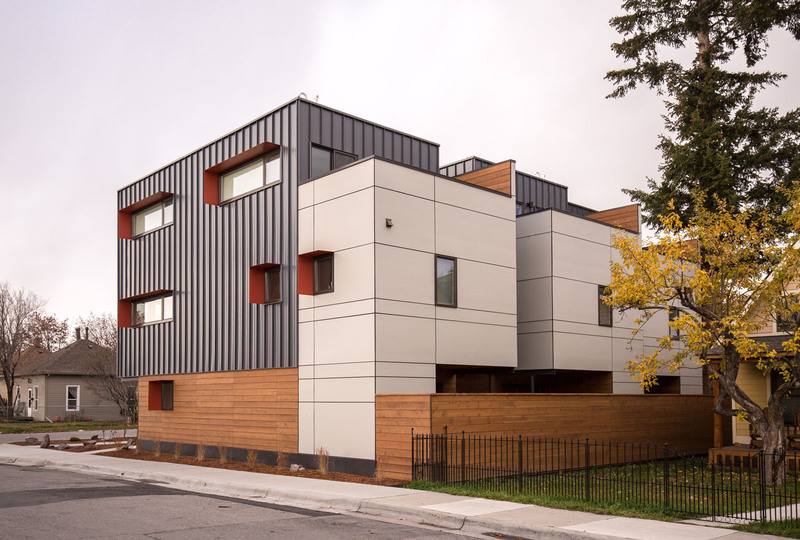 This project demonstrates that sustainable infill site strategies and smaller residences with more attention to design and detail can compete and thrive as a development model in local housing markets.